What’s Happening to Minnesota’s Moose? Although the state’s moose range once covered about a third of the state, Minnesota’s moose population has been confined to the northeast corner of the state for more than 50 years. 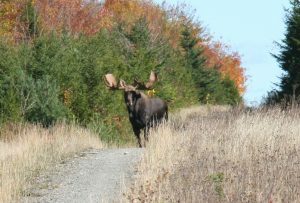 Hunters were allowed to apply for a once-in-a-lifetime tag and moose hunting has been very limited. However, the moose population has been falling for about a decade and in 2013, the DNR suspended the moose hunt. Now there’s a move to put the moose on the endangered species list. Their population dropped from an estimated 9,000 ten years ago to a low of 3,450 in 2015, but experienced a slight uptick to an estimated 4,000 in 2016. The endangered species act (ESA) has been very successful in restoring threatened populations of wild animals. The bald eagle and the wolf are good examples. However, animal rights activists have begun to use the ESA as a weapon against wildlife conservation more and more these days. The timber wolf population, for example, has been restored far above goals for several years. The Minnesota DNR opened a wolf season for two years to help control the large population of these predators before anti-hunting groups such as the Humane Society of the United States (HSUS) sued to end wolf hunting and won a court battle to end wolf hunting. Wolf populations are dangerously high in Minnesota and hundreds are killed each year by government trappers when they prey on livestock. GPS collared moose have helped the Minnesota DNR learn more about the moose and what is causing their decline. They have found that about 1/3 of the calves in their study were killed by wolves. It’s also clear that many adult moose are being killed by wolves. A series of warmer than average winters, according to researchers, causes stress on the moose, which makes them more vulnerable to predation by wolves. Warmer weather in the north country also creates a fertile environment where brainworms and other parasites can thrive, causing further mortality. The stress caused by collaring and handling of these moose by researchers has contributed to mortality and in fact Governor Dayton put an end to the research in 2015. Animal activists have seized the moment to try to put moose on the endangered species act where they know they have the huge bankroll to fund court battles against any hunting of moose when and if the population does recover. Once they get the moose on the ESA, it’s hard to get them off, and they know it. Leading this charge is the Center for Biological Diversity, which has consistently shown strong leanings against common sense wildlife conservation through regulated hunting. 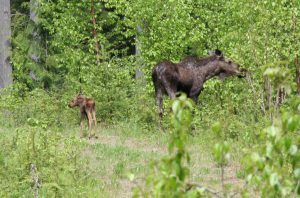 Collette Adkins, an attorney for the group, stated that a federal protection of moose would highlight the harm caused by a warming climate and failed effort to curb greenhouse gas emissions. High wolf numbers are taking a huge toll on a struggling moose population. Unfortunately, emotion is trumping common sense in wolf management. Minnesota, like many states, has large rural areas where people are a part of the natural process, the life and death of wildlife. But much of the decision-making within the state takes place in the large urban centers where people are out of touch with wildlife and believe any fallacy put forth that tugs at their heart. Animal rights activists can have their cake and eat it too. They use the emotional case of the wolf to raise funds, then use those funds to fight against the reduction of an overpopulation of wolves which take a huge toll on the moose populations. Then in turn they can raise funds with emotional appeals about the plight of the moose. Money controls wildlife more than ever and the HSUS and PeTA groups of the world control the money. Minnesota needs to control what we can with regard to our struggling moose population. We cannot control the weather but we should control the burgeoning wolf population. A reduction of predators would increase young-of-the-year calf survival numbers and reduce predation on stressed adults. The revenues raised by sales of wolf permits would benefit the moose in many ways. And once this iconic northern animal recovers, moose hunting permits further provide funding for research and habitat development. However, getting that common sense logic through to a population of people out of touch with nature is easier said than done.